Home » Paid Duvet Day with Models Direct! There’s a big demand for model families – earning money and being together – doesn’t get much better than that….or does it? It does when you are selected to work as a model family, in your pj’s, on a bed for the day, paid to have a duvet day – yes please!! That’s just what one of Models Direct’s model families was selected to do by Mattressman for a recent product shoot. 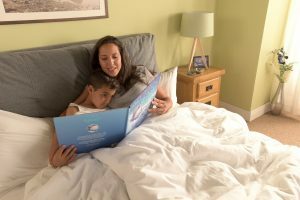 The shoot took place in Norwich and the Brown family had a lovely day relaxing, playing games and reading on a big bed in their pj’s – what fun!! The Models Direct team were delighted to be able to offer this opportunity! If you think your family has what it takes to be a model family then check out www.modelsdirect.com for all the information. Models Direct’s favourite Halloween Looks & Tutorials!